Jewish history features enough real apocalypses to daunt even the most powerful imagination. 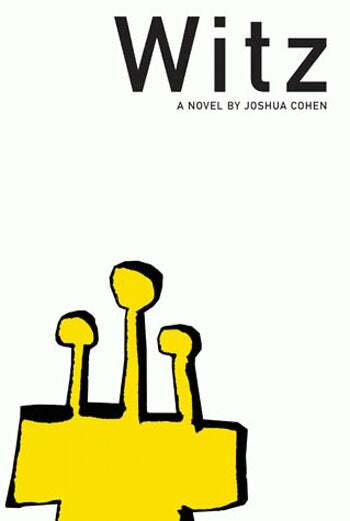 But that didn't stop Joshua Cohen from producing Witz, a colossal novel about the last Jew on Earth. Benjamin Israelien, a Candide-like innocent, is the sole survivor of the extermination-by-plague of all the other Jews in the world at the turn of the current millennium. But Ben is not a very Jewy last Jew. His hair is blond, his eyes are blue, and his foreskin regenerates after every attempt to circumcise him. (I imagine Jesse Eisenberg playing him in the movie.) His level of religious observance is also minimal, which becomes a problem when the world begins converting to Judaism. Cohen's most fundamental inversion in Witz is to ditch the familiar tropes of anti-semitism and make the book's alternate present an intensely philo-semitic one, with the destruction of the actual Jews sparking a perverse Jewish revival. Not just of the religion, either: people get their noses enlarged, trade their Anglo names for Jewish ones, etc. With more and more goyim converting, Ben quickly becomes a celebrity (the last of something! ), then a pariah (not Jewish enough! ), and finally a fugitive in a newly and entirely Jewish world. Ich bin Doktor Froid, also sprachs the apparition meeting Ben over the threshold holding open the door by a muscular and hairy hydrostatic tentacle suckling knob; and either this is the language aliens speak, or the good Doktor's just flown down from atop Mount Sinaius, affecting the sentimental out one nostril, the nostalgic out the other – two tablets to assuage the adenoidal, with an additional heil from tonsils deep in the glottal to this indescribably guttural European language, spoken today in no Europa known; a tongue ethnically tentacular itself as it's reaching, always louder and damning, both velar and palatal but always emphatic, whatever it is, and from where besides the mouth opened wide in His very own head. Und your acquaintance, it says, or he, ist very gut to finally macht…waddles up from the armchair on four of his or its seasidereal, iridescent appendages, to greet Ben with two suctorial kisses, one for each cheek, which Ben's then compelled to return unfairly, with four kisses, one for each of the cheeks of the Doktor, or for what He perceives as cheeks, which are really four faces, each slickly bearded and with two cheeks each of their own, sopping with respiration's expectoration or shvitz. That's the paragraph that heads the book's most science-fictional episode, which finds Ben aboard a spacecraft helmed by a Freudian-Zoidbergian alien doctor devoted to preserving the last of everything. I ought to note that Ben isn't the only last Jew in the book. His story ends a number of pages before Witz itself does, and the remainder is a Molly Bloom-like transcript of the experience of another who merits the badge of lastness: the last living survivor of the Holocaust. "Joseph ben you don't know him much like God I don't need a last name" is what he calls himself, and while his share of the book is brief, it's as potent as the hundreds of pages that come before it. The dual-world mechanics employed by Cohen, as well as his encyclopedic and berserk style, strongly recall the juxtaposition of real and alternate histories in Sesshu Foster's Atomik Aztex. That book's hero was both a humble meatpacker in this world and a proud warrior in one where the Aztecs conquer Europe. While Witz claims no identity between Ben and Joseph, it shares with the other book a concern with the arbitrariness of history and of victimhood. Ah, victimhood. Anti-semitism in America never reached the genocidal heights it did in Europe, and many of the current generation of American Jewish novelists ("The targets might be Michael Chabon, Jonathan Safran Foer, Shalom Auslander," Cohen said in an interview in March) appear unable to affect anything beyond the sentimental or the nostalgic when wrestling with the topic in their own work. Witz is designed to end that tradition. As art it succeeds, and as alternate history it's an expert satire of both the American Jewish literary canon and the privilege currently enjoyed by many American Jews (myself included). Any future Jewish epics are going to have to start from zero. You can buy Witz from Dalkey Archive Press.